J.M. 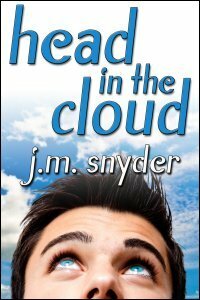 Snyder » Head in the Cloud now available! Head in the Cloud now available! My latest short story, Head in the Cloud, is now available from JMS Books! College senior Jake Mallory cares more about his reputation as a former high school jock turned party animal than his grade point average. His time in class is spent counting down to the weekend, when he’ll hit the gay club scene with his roommate Holly, who doubles as his designated driver. To celebrate being back at school after summer break, Jake parties so hard, he wakes up Sunday morning with blurred memories of the past two days. Worse than his hangover, though, is the fact that he can’t find his iPhone. Holly’s best friend Evan Williams is a grade A nerd, complete with slicked-back hair and thick, dorky glasses. Jake can’t stand Evan on principle, though it’s obvious to anyone with half a brain that Evan has a major crush on Jake. No matter how mean Jake is to him, Evan just won’t take a hint. He might even know something about the missing phone, but Jake won’t give him the time of day to hear what he has to say. Holly knows who the guy is but she isn’t telling, so Jake begs her to arrange a meeting. He wants his phone back, but more than that, he wants a chance to take things further with the hot stranger. She agrees to throw a house party and invite the guy over. At first, Jake is pissed when he doesn’t show up. Jake doesn’t even know who he is. But as the night progresses, he gets his phone back … and so much more.